What’s better than one set of Legends and Bandolero races on a Saturday in January? Two, of course. 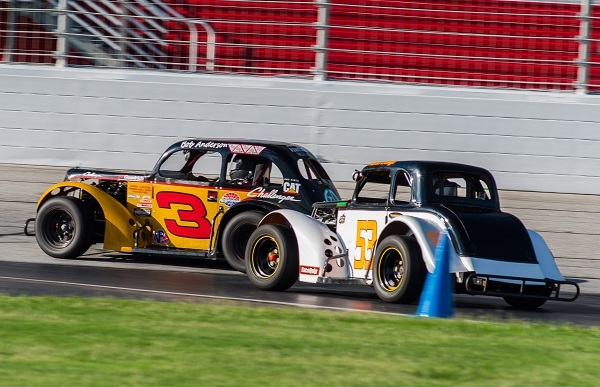 Drivers in Atlanta Motor Speedway’s Legends program not only fit double the racing into one day, but they did so on a challenging course that combined the best of the Speedway’s infield road course and the Thunder Ring. The course tested drivers’ road racing prowess, with mastery of sweeping left- and right-handers and tight corners alike necessary to win. If that wasn’t enough, there was one more wrinkle to handle, too. Legends and Bandolero divisions were combined for the feature events, pitting veterans of the Legends program against up-and-comers at the same time. In the Pro/Masters mixed events, Joshua Hicks (Pro) performed spectacularly, leading every lap of both features en-route to two overall victories. Doug Stevens (Masters) took home top honors in both races for his division after spending the majority of both features just behind Hicks in 2nd place. Stevens took 2nd in the first feature and appeared to be on his way to another runner-up finish in the second feature before a last-lap pass by Hunter Johnson (Pro) bumped Stevens back to 3rd overall. In the Young Lions and Semi-Pro mixed features, Cale Hall (Semi-Pro) took the overall victory in both features. Blaze Crawford (Young Lions) swept the victories in his division thanks to a pair of 3rd-place overall finishes. In the Bandits and Outlaws mixed features, Justin Campbell and Kenny Brady (both Outlaws) dueled throughout both races for the top spot. In the end they split the doubleheader with each claiming a feature win. Taking top honors among Bandits in the first feature race was Bailey North, who finished 5th overall. In the second feature, a 3rd-place finish by Ryan Younginer was the best among the Bandits. In the Rookie Bandoleros, a division of racers learning the ropes as they prepare to jump up the ranks of the AMS Legends program, Garrett Gumm took his fellow rookies to school on the road course. Gumm, who also took the checkered flag first at the Atlanta Motorsports Park road course when the AMS Legends program went to Dawsonville last fall, led every lap Saturday en-route to a pair of victories. The next Legends and Bandoleros event is scheduled for February 9. More information can be found at www.atlantamotorspeedway.com or www.legendsofga.com.